When Mama Comes To Town - Hypothetically Speaking . . . Hypothetically Speaking . . . There are some moments in life when you suddenly realize you’re in absolute crisis mode. It just happens. That moment when you’re bumbling along the road of life in a Pinto and you blow a tire and your car slides into a ditch and then rolls off a cliff and lands on a deer. Maybe it lands on a family of deer. A troop of deer. A rack of deer, if you will. You live through all that and crawl out of the car just moments before it blows up. As you look back at the remains of your car and the flock of deer, your student loan collector walks up and asks if this month’s payment will be on time. Then, out of nowhere, Uncle Sam pops up and says he will call an ambulance for you, but only if you hand over your debit card to put towards the you-just-had-an-emergency tax and the you-just-landed-on-a-deer tax he created when your car flattened Bambi. That was the level of crisis I was feeling as I prepared for my parents to visit. I don’t know about you, but parent-proofing my apartment takes at least a day just to assess the damage and a whole week to act on my findings. The process usually ends up with a lot of crying and me tearing my remaining hairs out. Just when you thought male pattern baldness was caused by genetics, I’m here to tell you that it really happens because someone’s mama decides to come to town. You get the mama call, and your hair just starts running for the hills. Whenever my mom visits, I wonder why I’m not a better person. I mean, I’m almost 87. You’d think I’d have my act together by now. Instead, I frantically run around my apartment pondering how to hide all the incriminating evidence showing that I haven’t cleaned my stove since at least 1942? And where does all the clutter come from? Rolling around on the floor, I question when the last time was that I vacuumed and if I even own one. I got so anxious that I thought about calling in some professionals. Sometimes you just have to know your limitations, and cleaning the house in a mother-approved way is definitely one of mine. 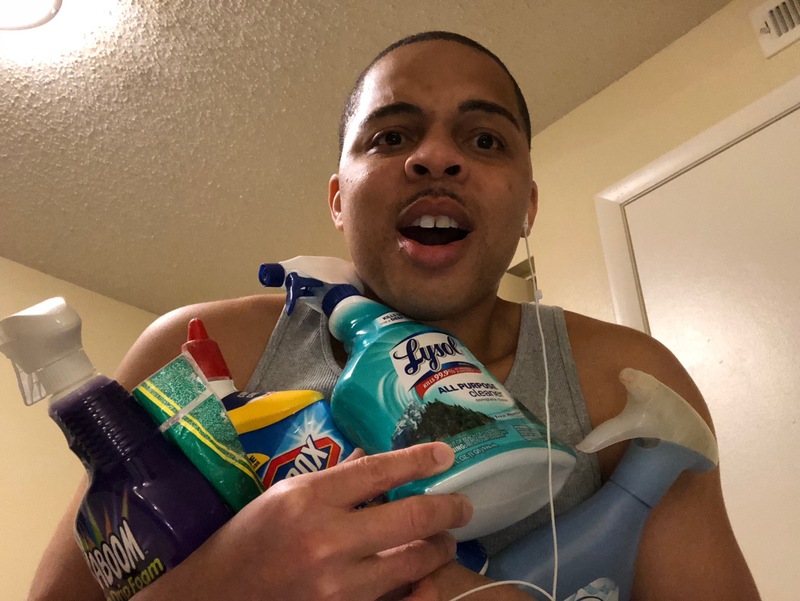 Matter of fact, I thought about having Merry Maids come in to do a full cleaning, and then calling the Maid Brigade to do a second cleaning just in case, and then having someone else’s mama come do a walk-through to provide feedback before my own mama arrived. After all, my mother is the mother of all mothers and you can never really be too clean or too prepared. I don’t know what it is about my mother, but her ability to detect a speck of dirt on a floor that is otherwise sanitized and sparkling clean is uncanny. She should be studied. It’s like she walks in the door, and before she sets her bags down, all the dust and dirt particles and the expired products call out to her. Somehow she finds every single flaw in 30 seconds or less. The last time she visited, she found a carton of milk that expired in 2003. I swear it wasn’t there before she got here. Maybe she brought it with her and put it in my refrigerator just so she could hold it against me. I wouldn’t put it past her. Her senses are so good that I’ve thought about secretly signing her up to join search and rescue parties in the area. However, after the team witnesses her skills, I’m scared she’ll put the dogs out of work. It’s already hard enough to get unemployment benefits without my mama sniffing around—literally. I mean, who wants to go down to the Department of Labor and stand in line behind an angry Irish Setter and an irate German Shepherd? Certainly not me. Anyway, you should have seen me running around the house with a feather duster in one hand and a vacuum in the other. At one point I thought about just throwing everything away and starting over, including the couch, refrigerator, and the bed. I would have left it all on the curb if I could have lifted it by myself. If only I had gone to the gym more last year. Hmmm. Alas, I was stuck dousing everything in bleach and Pine-Sol as if my life depended on it. If my apartment wasn’t going to actually be clean, at least it would smell like it was. As time passed, I began to clean so frantically that at some point I killed George Foreman. It wasn’t exactly my fault though. I was scrubbing the cabinet area without actually moving the stuff inside the cabinets. Don’t judge me! I’m a cleaning novice! I figured that wiping around the stuff was better than no wiping at all. 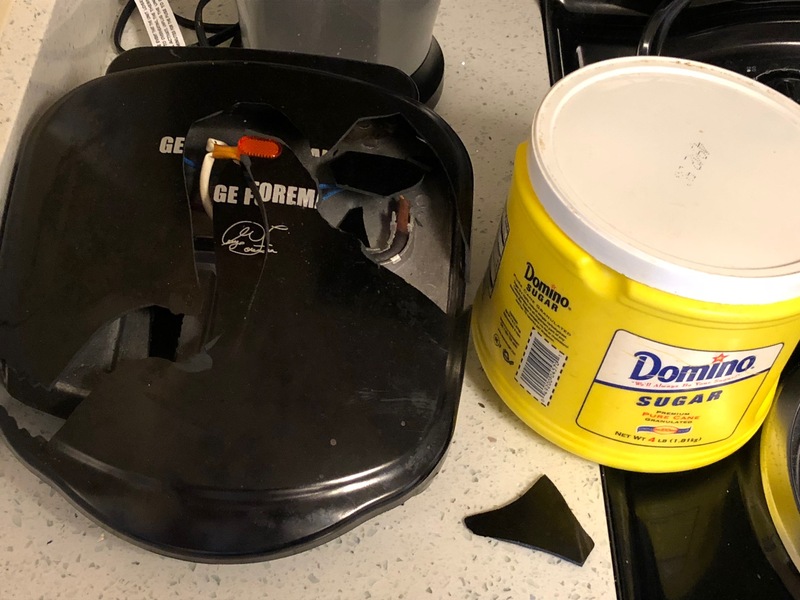 At some point I dislodged the container of Domino Sugar from the shelf and it landed on my George Foreman grill, smashing it into bits. Lets have a moment of silence for my George Foreman grill. Now that I think about it, I would have expected my George Foreman grill to be a bit sturdier. After all, George was a heavyweight champion and an Olympic gold medalist. I’m surprised he couldn’t handle a little sugar. Then again, now that I think about it, maybe my Domino Sugar Ray Leonard had this all planned to defeat George Foreman the whole time. Who am I to say? Either way, I’m taking the grill back to Target to complain and demand a refund. 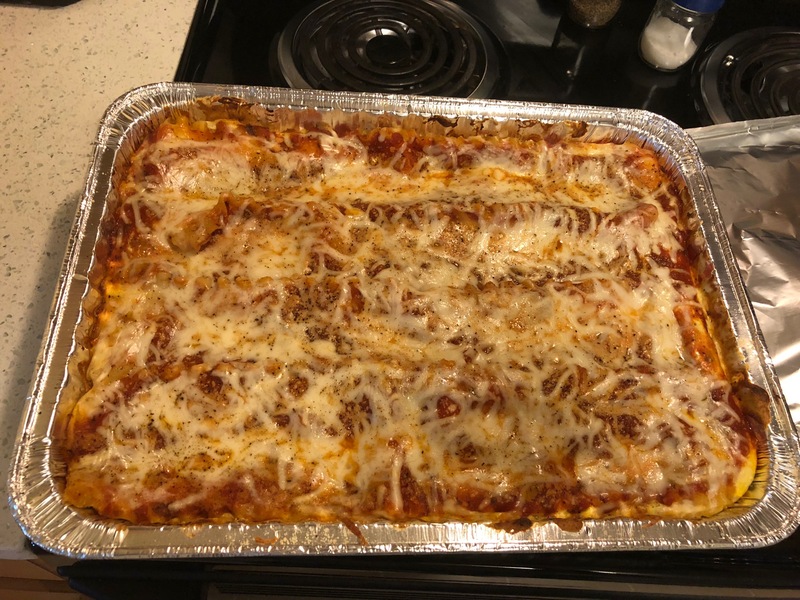 Because I may have told my parents a slight untruth that I never eat out, I quickly threw a lasagna together to give the appearance that I actually use my kitchen as more than just a dance studio. I mean, the floor and the lighting are perfect to practice all the latest dances like the Mashed Potato and the Funky Chicken. Unless my parents are here, there really is no need to do the things that a gourmet chef would do, like boiling water. It’s just too much effort. But for my parents, I figured I would give cooking a shot. 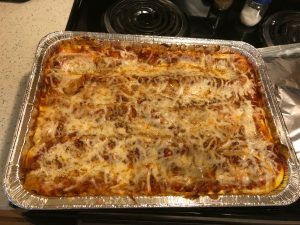 The lasagna turned out great. Well, my 46th attempt turned out great. The first 45 failures weren’t exactly my fault. I had done so much cleaning that I kept falling asleep with the lasagnas in the oven. I can tell you from experience that firefighters are nice people the first time they have to come to your home with the hoses blazing. Around about the third or fourth time they show up in a single day, they aren’t so friendly. I wrote that in my Yelp review of the local fire station. Mama, I made a lasagna!!!! In the process of cleaning out my refrigerator, I wondered how I had somehow acquired so many bottles of liquor. However, maybe that explains why I hadn’t see the milk that stayed in there since 2003. In any case, having any form of alcohol in the house was completely unacceptable by my mama’s standards. So, I did what any normal person would do. I chugged it all down a few minutes before my parents arrived so that I could at least pretend to be a responsible adult. Sometimes you just have to take one for the team. Watch me make this disappear. Umm, just doing what I have to do. I know what you’re thinking. Guzzling 7 bottles of vodka and 2 bottles of rum in less than 5 minutes isn’t exactly responsible. Some would even say it’s a bit dramatic. 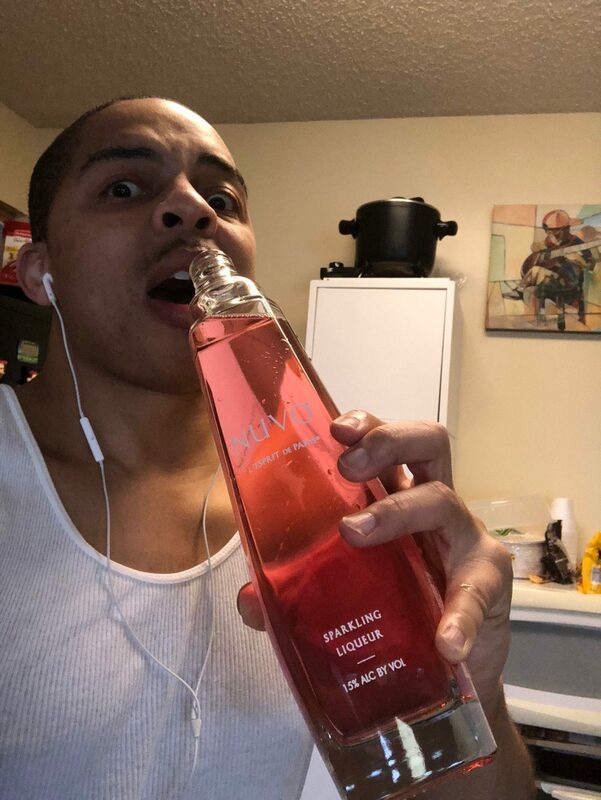 However, the last time my mama found something as simple as rubbing alcohol in my bathroom, she immediately checked me into the Betty Ford Center with no questions asked. I was ten. She has absolutely no tolerance for alcohol. To this day I still have to go to Alcoholics Anonymous meetings every Tuesday and Thursday evening. In addition to my stint at Betty Ford and my ongoing AA meetings, I was sentenced to 183 years of community service. That noted, I spend every weekend on the side of the highway picking up litter, which is absolutely gross. You would be horrified if I told you some of the things I’ve found. Sometimes I even find litter that I tossed out. You should have heard my scream of excitement the moment I found my lost wallet in a discarded McDonald’s bag. I know we shouldn’t litter, but I’d been pulled over by the cops and I panicked. No one really knows what’s in a Big Mac’s special sauce, and I certainly couldn’t take any chances. I’m not going to jail over a value meal…again. That noted, if you happen to be driving around and you see a group of guys on the side of the road, feel free to beep or wave. If one of those guys looks like me, please do not stop to ask for an autograph. The sergeant really doesn’t like it. For each autograph I sign, I get sentenced to another year of service. Again, please, PLEASE hold it together if you ever see me. Just pretend I’m any ole body picking up bottles on the side of the road, hoping that the yellowish liquid is really just stale water. I doubt it. Maybe I should ask my mama.